Barbara is Western Canada's top Marilyn Monroe impersonator. Her effervescent personality and striking natural resemblance to the Hollywood icon will leave you breathless. A classically trained actress and seasoned improviser, Barbara brings years of performance and comedic experience to her stunning act. Marilyn was awesome. The group of friends had a great time. She was in character from the time she entered to the end. I would highly recommend this entertainer. She will be the highlight of any event! Marilyn was the talk of the event, and helped make it one to remember. Totally professional, smart and in-character at all times, Barbara was great to work with and made for a stress-free evening. She's great with people, totally "gets" the fine-line between professionalism and entertainment (and knows when to appropriately push those boundaries), and created a wonderful atmosphere for all guests. Highly recommended. A wonderful, highly professional performer of top notch caliber. Very good interacting with people/ guests. Excellent look, beautiful, captures Marilyn's appearance. You we're spectacular, you encapsulated everything that was poignant to Darren. We were stunned, thrilled, amazed and enamored by your presence and I can't thank you enough!!!! Xoxoxo I am so grateful to you for touching my husband so profoundly on a particularly struggling milestone, considering most of us thought he would never see his 40th. I will forever cherish your performance Barbara, as you truly touched our family's heart. You can expect a dazzling and entertaining experience of the highest caliber. Barbara will personalize and modify her unique and effervescent performance to suite your tastes and needs. As soon as she walks in the room you will be blown away by her natural resemblance to this marvelous Hollywood icon. From her smile, to her dreamy eyes and melodic, breathy voice, Barbara's tribute to Marilyn Monroe is guaranteed to impress. The spirit of Marilyn Monroe is alive and dazzling in Barbara's captivating performances. 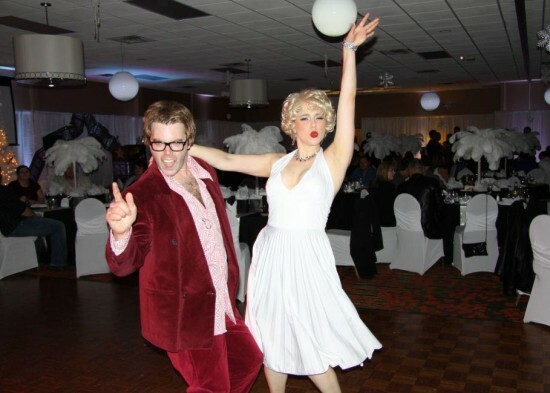 Highly skilled at Roaming Entertainment, Birthday Appearances as well as Host and Emcee services for corporate functions, this Marilyn is suited for every event! Barbara prides herself in being able to personalize her act to suit the needs of any event. Birthday Appearances feature a script written specially for you, designed to tickle the funny-bone of the Birthday Boy (or Girl). Highly experienced at Performance Improv, no twist or turn will derail Barbara from delivering the Marilyn Monroe appearance of your dreams. Barbara is a graduate of the University of British Columbia's BFA Acting Program. She is the first alumni of Theatre at UBC to be awarded the Hnatyshyn Foundation's Developing Artist Grant, a national Theatre Award founded by the late Governor General Ray Hnatyshyn. In the realm of comedy, improv and interactive theatre, Barbara has over a decade of experience. A member of the Vancouver Theatre Sports Rookie League, The Calgary Improv Guild and the VFS Sketch Comedy Troupe, Barbara has trained and performed with some of the best comedians in the country including Improv celebrity Colin Mochrie.